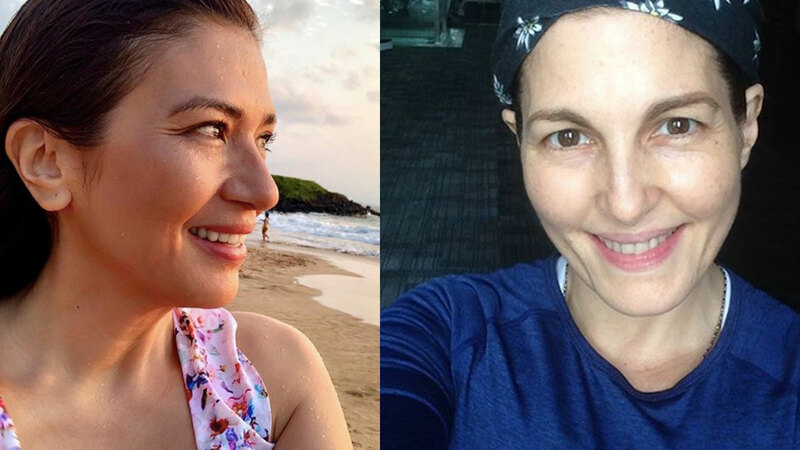 Zsa Zsa Padilla, 54, and Jackie Lou Blanco, 55, both have beautiful skin with or without makeup. While a lot of ladies are obsessed with filters, these actresses—mostly in their 50s—have no qualms posting their no-makeup looks on Instagram. Here's Eula Valdes looking so pretty up close on Instagram. On TV, she's currently playing Corazon de Leon in The General's Daughter. Her recent post showed her "fireworks"-inspired hairdo. She proudly wrote in the caption, "I really woke up like this!!!" By the way, her beauty secret is not expensive at all: "Stop worrying." She also does laser peel for her freckles from time to time. Janice de Belen likes posting selfies before she sleeps. This one's with her St. Bernard dog. What does she do to look young? In a previous interview with PEP.ph (Philippine Entertainment Portal), she revealed: "Do things you enjoy, surround yourself with people you love." Meanwhile, Dawn Zulueta looked smashing in her post-swim selfie. And what's the top item in her beauty routine? "Positive outlook," she once said. Agot Isidro remains a crush ng bayan at 52. Just like Dawn, she swears by the "nakakabatang effect" of positivity. Teresa Loyzaga, 53, loves her freckles, and looks lovely with them. Zsa Zsa Padilla, 54, is flawless sans makeup, thanks to facials and vitamins. Jackie Lou Blanco, 55, captioned this photo with, "This Woman is happy with her hair." Echoing the comments of her followers, we say, "We love her fresh-looking face, too." When Cherie Gil is not making us hate her for effectively portraying antagonist roles, she's making us envy her taut skin. She is 55. Also in photo: Her 21-year-old son, Raphael. This was Amy Austria's post last January. Her caption read: "No filter; no make-up; with pimples naman and chubby face! Hahaha." The ladies below are turning 50 soon, and aging gracefully, too.